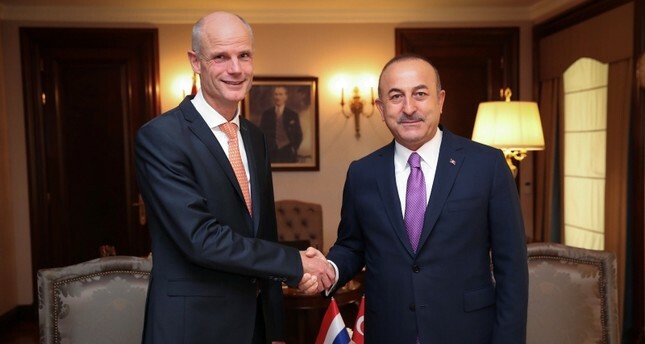 Foreign Minister Mevlüt Çavuşoğlu began his two-day visit to the Netherlands Wednesday upon the invitation of his Dutch counterpart, Stef Blok, to participate in the seventh meeting of the Turkish-Dutch Bilateral (Wittenburg) Conference and to hold bilateral talks. According to a statement from the Foreign Ministry, six working groups will convene Thursday with the participation and contribution from relevant ministries within the framework of the Seventh Wittenburg Conference, they include: the Fight against Terrorism, Regional Developments, Turkey-EU, Turkish-Dutch Community, Livable Cities and Energy. In line with the memorandum of understanding (MoU) signed in March 2008 aimed at ensuring the enhancement of Turkish-Dutch bilateral relations and the cooperation between Turkey and the Netherlands, the Wittenburg Conferences are alternately organized under the co-chairmanship of the Foreign Ministers. The sixth and last meeting of the conferences took place in Ankara on Feb. 14, 2014. During the talks, Çavuşoğlu and Blok are expected to exchange views on Turkey-EU relations and regional and international developments, as well as issues pertaining to bilateral relations, the statement read. Furthermore, Çavuşoğlu is expected to inaugurate the Turkish Consulate General in Amsterdam, meet with Turkish and Dutch business circles and come together with the representatives of the Turkish community in the Netherlands. Currently, the relations between the Netherlands and Turkey are on a positive track, leaving behind a period of strained ties. On July 20, Turkey and the Netherlands decided to normalize bilateral relations and restore full formal diplomatic ties. The countries reappointed their ambassadors as well. As diplomatic ties have recovered, economic ties are expected to be strengthened. The Netherlands is the number one direct investor in Turkey.